Contrary to popular belief, Winter Squash is actually a summer growing annual fruit that was first cultivated in the Andes. It is a member of the genus Cucurbita and represents many different Squash species. Cucurbita is Latin for Gourd and refers to both Winter and Summer Squashes. The main difference between the two is that Summer Squash is thin skinned and can bruise easily where Winter Squash is identified by its hard, thick rind. There are 5 domesticated species of Cucurbita that include both Winter and Summer Squash. Within each of the 5 are several varieties of Winter Squash that come in several shapes from round, elongated, scalloped and pear shape with flesh that is either golden yellow or bright orange. Varieties include Pumpkin, Butternut Squash and Acorn Squash to name a few. 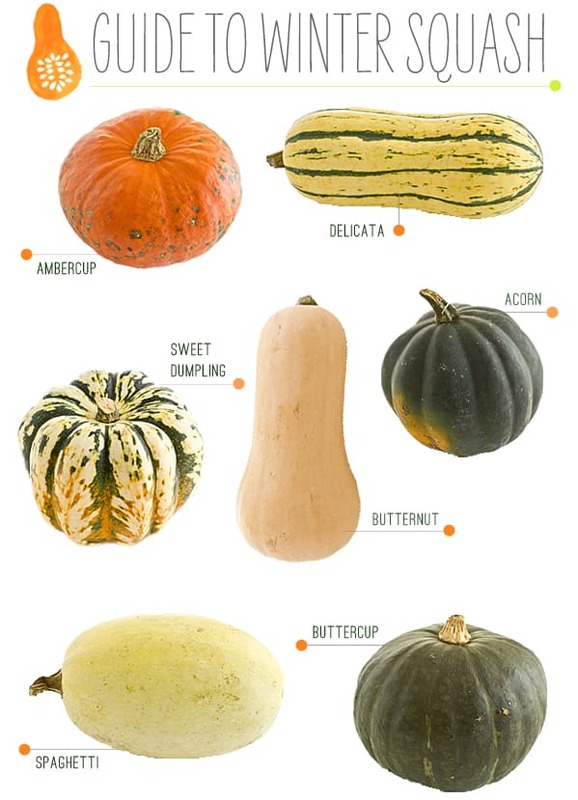 For a great visual guide to Winter Squash click here and for a list of Winter Gourds and Squashes click here. Most of the species are vines that grow several meters in length. There are two types flowers on the Squash plant, a female that produces the fruit and a male that is the pollinator. These plants also benefit from the pollination of aphids and bees. The Winter Squash growing season is late Summer, Fall and Winter. The fruit takes 3 months to mature and are best harvested when the weather starts to cool. The process for domesticating Squash took place over 5,000-6,500 years ago in Mesoamerica. Squash was domesticated first followed by maize and beans thus becoming the “Three Sisters Agricultural System of Companion Planting.” Cucurbita was spread to the rest of the world after Christopher Columbus arrival to the New World in 1492. A staple of the Northeastern Native Americans, the new settlers in Virginia and New England were not impressed with the Winter Squash until they were faced with long, harsh winters. Winter Squash stores well and at this point it became a staple in their diets. To make an early version of a Pumpkin Pie, the Pilgrims hollowed out a Pumpkin, added Apples, Sugar, Spices and Milk. They then replaced the Pumpkin top and baked. The name Squash comes from the Narragansett Native American word askutasquash, which means "eaten raw or uncooked." For more fun facts about Winter Squash click here and for facts about different varieties, check out this article from Food Network. For more about Winter Squash here. Store Winter Squash with woody stems, leave at least 4 inches or longer of the stem on the fruit. This will help the fruit retain its moisture. Winter Squash can be stored in a cool basement for months (50F-55F). High temperatures will make the flesh stringy. Acorn Squash has the shortest shelf life at 4 weeks. Spaghetti Squash is 4-5 weeks, Buttercup Squash is 13 weeks and Hubbard Squash is 6 to 7 months. If you notice a blemish begin to develop it may indicate rot. To read more about storing Winter Squash at home click here. Winter Squash is high in Vitamin A, Vitamin C, Fiber, Vitamin B6, Manganese, Copper and Potassium. Winter Squash provides antioxidant support given its Carotenoid and Vitamin C content. They also have anti-inflammatory benefits as Squash does contain some fat in the form of Omega-3's. Also, Winter Squash is considered to be a cancer preventer and aids in blood sugar regulation and the prevention of Type 2 Diabetes. There are also links to the prevention of cardiovascular disease. To read more about the health benefits of Winter Squash click here. Winter Squash can be prepared in a variety of ways and is delicious sweet or savory. Winter Squash can be preserved by freezing, canning and dehydrating. Read more tips here. Winter Squash is delicious roasted as it becomes sweeter as it caramelizes. They can be boiled, baked, braised and pureed in soups. For information on how to peel, seed and slice Winter Squash watch this video from Food Hacks here and for information on how to peel, seed and slice a Butternut Squash click here or watch another Food Hacks video here.